← Understanding the Difference Between Being the House of God and Being In the House of God! Understanding Symbolic Sheep in the Bible! Are You Once Saved and Always Saved? In this chapter of John and John is one of my favorite books of the Bible which I have studied more than any other except maybe Genesis, I find a very interesting set of statements being made. This man said that these verses prove that people are “once saved and always saved” by God and can never lose their salvation because that is just what it says. However, if you look very closely and examine the wording and context that is not what it says at all. Sheep are of course symbolic of people in this chapter. The sheepfold is the symbolic world that we live in. Jesus is of course the Chief Shepherd that is in charge of all of us sheep. These verses start with the statement that “My sheep hear my voice”. So right there we learn the first lesson. Not everyone is “His” sheep. You do not have to qualify the noun “sheep” with the adjective “My” if all sheep can hear His voice. Do you get it? So let me ask you a simple question, are you one of His sheep? How can you tell if you are one of His sheep? Is it just because you say you are? I believe our current President proves that is a lie in his actions every day. Saying you are a Christian does not make you a Christian ever. You might recall in the book of Acts that some men came up to a demon possessed man and said “In the name of Jesus that Paul preaches come out of him”. However, the demons said to them “Paul we know and Jesus we know but who are you” and they made them sorry that they confronted a being more powerful than they were (Act 19:13-15). These were examples of men who were not His sheep, but tried to act like it anyway. So you either are one of His sheep or you are not one of His sheep! What is it that determines this fact? It really is not that complicated, if you can hear His voice then you are, if you do not hear His voice then you are not. So let me ask you this, do you hear His voice? I know for certain that I hear His voice on a daily basis, what can you say about this? So the first thing that you learn is not everyone is His sheep and then only His sheep can hear His voice. So let me ask you this, if someone speaks and you are not paying attention do you ever miss what is said? My wife accuses me of this every now and then. She says something and I am sometimes distracted or not paying attention like I should and I miss what was said. Has this ever happened to you? Just because you can hear does not mean that you heard. This is proved every day in church. People sit in the congregation listening to the preacher and I would guess that only a small handful actually hear what is being said and understand it. So hearing is not the complete answer given here, I believe it takes more than just hearing. You can learn this from the Parable of the Sower when Jesus taught on the 6 types of soil, 3 types of soil produced some fruit and 3 types did not produce any fruit. But, they all heard the same words of the sower who was planting the seeds. So obviously there is much more involved than just hearing. Do you get it? Is Jesus talking about sheep in this parable? I don’t think so! Jesus is again using sheep as an example of people. However, it is very clear and self-evident that sheep can wander off and away from the voice of the shepherd that was guiding them. This tells me that Jesus the Great Shepherd is not in complete control of everyone on this planet and what they do. Any sheep at any time has the choice or chance to walk away. Do you get this concept? This is called “FREEWILL”. These are saved people who have walked away from Jesus’ voice and no longer are able to hear it. Do you GET IT? Of course Jesus says any good shepherd will leave the 99 and go and look for the 1 that is LOST! So here we go again. Does this mean the shepherd when He finds this lost sheep drags him kicking and screaming back to the flock by force? If you think it does then you again do not know the loving compassionate merciful God who allows His sheep to do as they will. 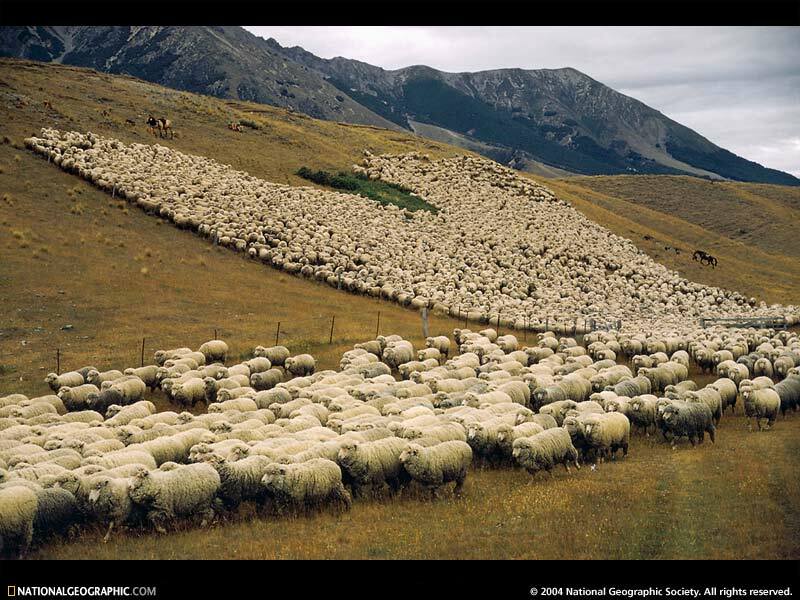 Sure a sheep could wander off accidently and be totally glad to get back to the safety of the flock and the shepherd. But, still people are not sheep, they are people and they can do what they want, when they want, to who they want at any time. If a sheep wanders off and commits suicide there is no getting that sheep back even if the shepherd wants it back really bad. If while away from the safety of the shepherd a wolf comes and eats that sheep, it is also gone forever. These are basic sheep principles of shepherds and their flocks. People want to think that God is in control of everything, but if this was true and God is the omnipotent, omnipresent, omniscient Almighty, He would have never let one of His sheep get lost in the first place. In this parable, it is clear that a sheep got away and the shepherd did not know about it until He stopped and counted and said I only have 99 and I started with 100 so one got lost. Wow, what do you do with people who ignore what the Bible says for their version of reality? It sure makes it difficult if you can’t see the words that written on the pages, doesn’t it? Let’s further examine the emphasized subject in verses 28 and 29 of John 10 that we were looking at first. If you can see, then you can understand that both of these verses are about the Power of God vs. the power of Satan. Both of these verses say that God is able to keep those that have chosen to follow Him. Remember that choosing to follow was an important prerequisite to the next two verses. So the next two verses are only applicable if you continue to follow by your freewill choices. As long as you are with the shepherd you are clearly SAFE and no one including Satan can come and force you away. This would be the opposite of forcible salvation; it would be called forcible damnation. If it is illegal for Satan to force you to hell, guess what it would be illegal for God to force you to go to heaven. This MUST be a two way street that goes both ways and the only determining factor which way you go is by your own choice of continuing to follow your faithful Shepherd. So did we learn anything today? I bet my commenter didn’t hear a thing that I said and that is really a sad state of the world that we live in. My Bible says “Whom the god of this world hath blinded the minds of them that believe not”. It is almost impossible to get a blind man to see. What you must determine is a basic question; do sheep still have any freewill choices to make in the real world after being saved? Can they do what they want rather than do what God says? Before you answer this question you should go and read your Bible and see if there are any people in there who God said not to do this and they ignored it and went and did it anyway. There is Balaam, there is all of natural Israel, there is even Moses who God said speak to the rock and he hit it instead. There are too many examples in the Bible of people disobeying God’s voice. Why did God pick sheep as a type or symbol of people in the world? You should study more about sheep and learn how they are a picture of people. For example, sheep are pretty dumb animals, I have to admit that and that speaks a lot for God’s opinion on what people think in the world. You should be smart enough to first see that God’s intelligence is so far above your intelligence that it is barely comparable to a man vs. a sheep. So having said that your opinion is worthless! What you think about the Bible is totally irrelevant! There is no significance to your thoughts unless they become God’s thoughts. So what have we learned about sheep today? People like Sheep are DUMB! Sheep still have a free will! Not ALL Sheep belong to God! Sheep still have to pay attention and understand the words of the Shepherd. A Sheep can Get LOST accidently or on purpose! God will try to go and find the lost sheep! Not every sheep has to follow the Shepherd! No one can force a sheep away from His Shepherd as long as it hears and follows. These are the basics found in these verses about sheep in the Bible. You of course can disagree with what I just said and ignore the facts if you want to. But, please do not write me any more ignorant comments about my lack of understanding of the Bible and go pull the plank out of your own eye before you try to take the speck out of mine. God Bless! If you want to continue reading about Once Saved Always Saved and the Eternal Security subjects you may go to “Part 4“. Posted on October 28, 2010, in Bible Basics, Bible Study, Understanding and tagged Bible, Christianity, Church, God, Interpretation, Jesus, Prophecy, Religion, Revelation, Salvation, Satan, Symbolism, Truth, understanding. Bookmark the permalink. 3 Comments. That appears to be a paradoxical contradiction with freewill teaching. It appears to say election is correct and salvation is totally up to God. However. That is incorrect theology. Man will always be given the right to choose. Choose wisely and believe and you will be saved. God Bless.